As SEO becomes more and more competitive, businesses need to continually update and adapt in order to drive more traffic to their websites. Social media is no exception. Many businesses rely heavily on social media to gain customers for their products, which is why so many companies pay a large amount of money to be sponsored on social media sites – the results are extremely effective. But more important are the number of people reached organically, or without even paying for it. Today, because there’s so much content out there, yours may be in danger of getting lost in all of the noise. 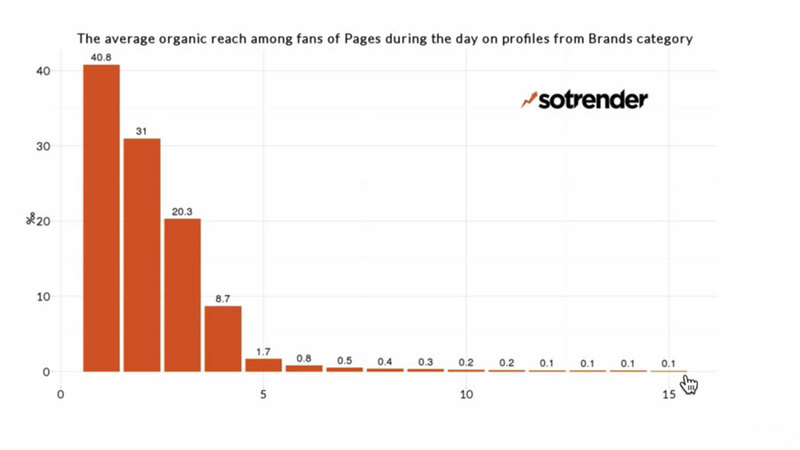 Here are 8 tips on how to reach more people organically on Facebook. A huge part of reaching more people is reaching the right people. Facebook has the ability to target not only specific demographics (age, gender, and location), but also a person’s specific interests. Enabling this on Facebook changes the people who see it in their news feed. You can choose who you target by analyzing the demographics of people who already engage with your posts. Although the number of people you reach might be smaller, the percentage of engagement with your posts will be higher. If someone shares the post, only people in the audience you choose for the post will be able to see it. And that’s it! Now you are able to target specific demographics for your Facebook posts. Be sure to check the analytics to be sure you are targeting the right audience. When it comes to SEO, there is a big difference between videos that are shared directly through Facebook and videos that are shared on Facebook via a third-party site. Although it might be the exact same video, the way you share it can drastically effect how many people like, comment, and share it. 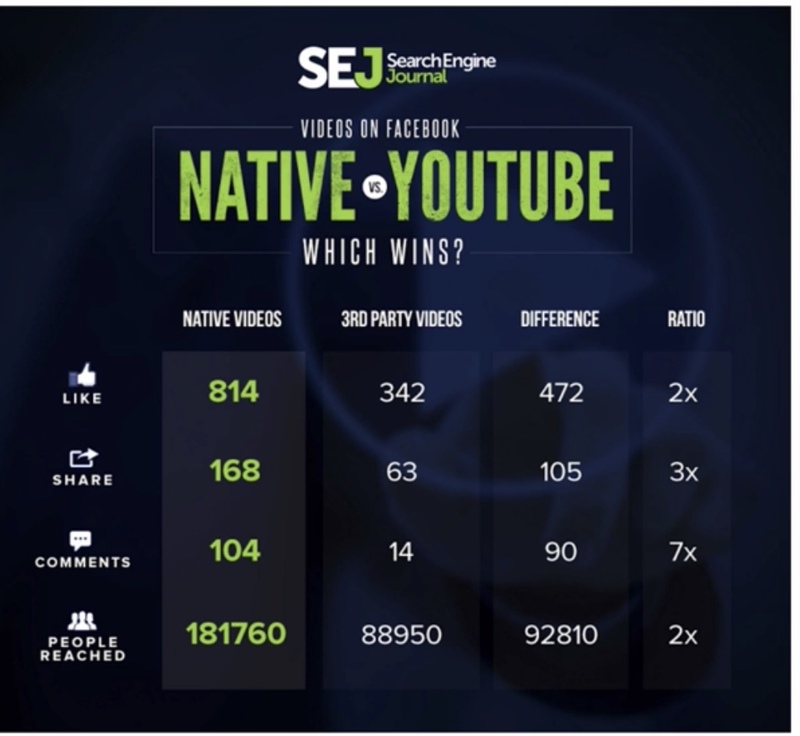 These statistics from Search Engine Journal show that videos that are native on Facebook reach more than twice as many people, as well as get twice as many engagements. Not only is the video displayed very differently, but it is also read differently by search engines. If the video is posted directly through Facebook, you can add video tags, as shown below, which help your video be discovered by a larger audience. Another way to get more traffic organically is to make sure your existing followers don’t miss a post. Recommend to your followers that they change one of their settings so that your business’s posts are seen first. 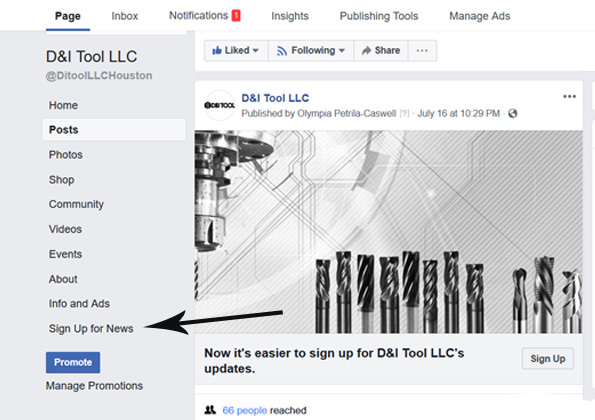 All they have to do is go to your business’s page, click the “Following” drop-down menu, and select “See First.” Now your posts will appear at the top of their News Feed, rather than getting mixed in with all of the other content. And to take it one step further, your followers can even be notified every time you post something new. In the same drop-down menu, under “Notifications,” they need to select “All On (Posts).” This will cause your followers to receive a notification in the Facebook app every time you post, so they will not miss a single post. It is more important to choose good hashtags than just adding a lot of insignificant ones. The website www.hashtagify.me can help you figure out exactly which tags are important to include. All you have to do is type in a keyword that is relevant to your post, and this site will give you tons of information about that hashtag, including related hashtags, hashtag popularity over time, and top influencers using that hashtag. By using this tool, you can be sure that you are using the most relevant hashtags. Another thing to consider is the amount of posts per day you decide to share. This study showed that more posts does not necessarily mean more engagements.This adds a new tab to the sidebar, and you can customize this to be called anything you like. 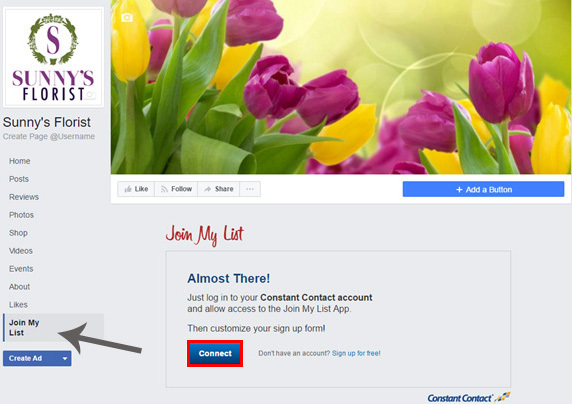 Now your customers can add themselves to your mailing list right from your Facebook page! While your content would appear more often in users’ news feeds, if there are too many posts, your users might ignore them. Around 1-3 posts a day is enough to keep your followers interested, without overloading them with content. Similarly, it is important to post during high-traffic times of day. The same post at 4:00 in the morning will not get nearly as many interactions as one posted at 4:00 in the afternoon. But the best time of day also depends on your target audience. If your target audience is employees working an office job, it would be best to post during regular business hours. If your target audience is teenagers, it would be better to post later in the evening, after school gets out. Facebook even offers tools to track when your users are online. With a little bit of market research, you can figure out what time of day would be ideal for reaching your specific target audience. 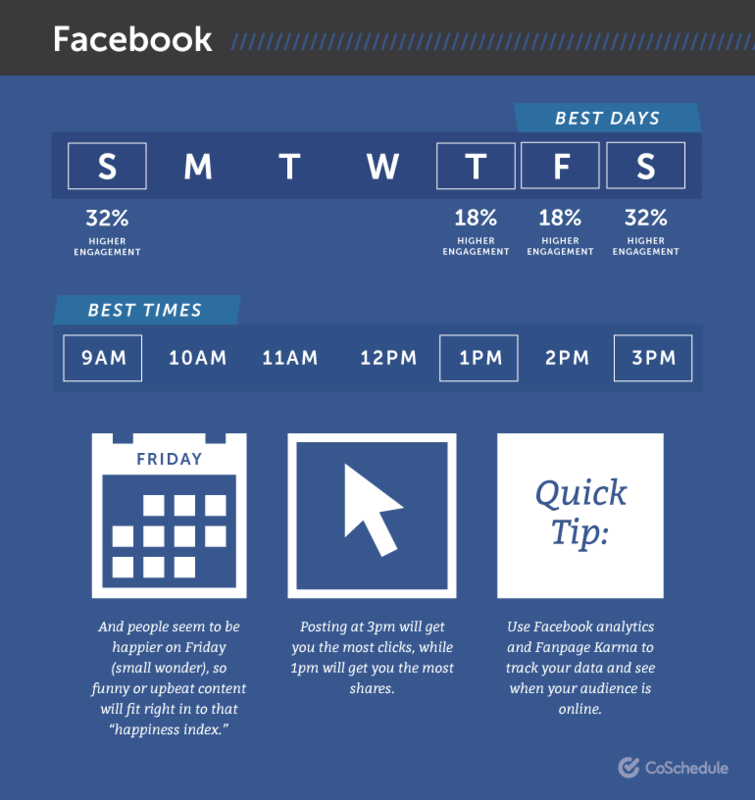 According to this blog, the best time to post on Facebook is 1-4 p.m. late into the week and on weekends. Saturday & Sunday at 12-1 p.m.
Thursday &Friday at 1-4 p.m.
Facebook groups create a sense of community around a specific interest or goal. By creating a group for your business, you can gather your followers and communicate with them, helping them to get the most out of the product or service that you offer. In order to make a Facebook group, all you have to do is name your group, set up the privacy settings, and then invite people to your group (start by inviting your most active followers). Once you have created your group, get everyone involved. Rather than simply posting your own content, encourage your members to post their input as well. This provides a sense of community! While all of this is important, none of it matters if you don’t have great content that people are interested in reading. Great content is relevant to your business, but also covers a variety of topics. Your topics need to stick to a similar theme, but also vary enough that they don’t become repetitive. With these 8 steps, you will be sure to notice an increase in your organic traffic to your page, and more engagements with your posts. If Facebook or Search Engine Marketing is new to you, Tinetrix can help! Contact Us today! To get the most out of your Facebook marketing, it is crucial to optimize your page by inserting keywords to improve the chances of search engines finding you. Let’s be honest - when was the last time you scrolled through more than the first (or even more unlikely) second page of Google search results? To reach the largest number of people your page needs to appear as one of the first few search results, or it could get lost in the clutter. There are several simple and easy ways to help your Facebook business page climb the search engine ladder. They say a picture is worth a thousand words! The first thing many people see when they click onto any web page is a photo that catches their eye. Canva is a FREE online tool that will help you create stunning, professional images for your Facebook cover. First, go to Canva.com, and create a free account. Now you have even more templates to choose from. Scroll down until you see the heading “Social Media & Email Headers.” In this category, select the one for Facebook Cover. You can now choose from hundreds of different templates and designs and customize however you would like! *Tip: If you happen to love one of the designs that isn’t free, just replace the photo with one of your own. The stock photo is the one that costs money, but the rest of the design is still free! When you are finished customizing your header, click download in the top right corner, and your photo is ready to be shared on Facebook. Keywords are words that search engines look for on your website because users are frequently using them to search. These words can be related to your services, products, or other aspects of your business. Knowing what other people are searching for gives you insight on what kinds of content to put on your page, and how to reach more viewers. Basic keyword research is easy (and free) and can drastically improve your Facebook page’s search engine optimization. Once you have found the keywords that you would like to include on your website, add them to the About tab of your Facebook page. They should not be given as a list of random words, but rather woven into your existing content. Sprinkle your keywords throughout the text, and try to keep it subtle. You want the information to flow naturally not make it obvious that you are forcing specific words into your website. Although this tab is not included with the default tabs that come with a Facebook business page, this tab is very important. For a step-by-step on how to add this tab to your page, click here. Once you have created this tab, add the different services that your company offers. List them all, and don’t leave any out. This way, when people are searching for specific services online, your website will be listed for that specific service. And finally, the last way to optimize your Facebook business page is by adding a sign-up form. This way, potential customers have a place to leave their contact information, continuing the conversation between the two of you. The best way to do this is by linking an existing Mailchimp or Constant Contact account to your Facebook page. This way, all of your customer information will be sent to the same place automatically, without requiring any additional steps. For a complete guide on how to link your Mailchimp account to your Facebook business page, click here. The process is very similar for Constant Contact. Simply login to your Constant Contact account, click the Integrations tab, then the Facebook button. Click Get this App, then select Facebook page and complete the installation. For a complete guide, click here. This adds a new tab to the sidebar, and you can customize this to be called anything you like. Now your customers can add themselves to your mailing list right from your Facebook page! If email marketing is new to you, Tinetrix can help! And that’s it! You now know 4 easy steps to optimize your Facebook business page. You've heard of SEO and you think you might need it. It can be complicated, but working with someone familiar with the issues can help a lot. Search Engine Optimization or SEO is an online marketing strategy used to increase the amount of visitors to your website by obtaining high-ranking placements in the search results pages of search engines including Google, Bing, and Yahoo. This is also referred as an organic search. There are three types of Google results: Sponsored or Paid Search, Local Search and Organic Search. What is Local SEO? Local SEO refers to the same type of marketing strategy used for businesses to promote their services to local customers by using business directories like Yelp, Superpages, Yellowpages, etc. Which one is right for you? The answer is both. Search engine rules have evolved (to the 200+ criteria that Google uses) and will continue to evolve. Google has one objective - to return the most relevant and useful content based on the keyword or phrases a user types in. Reaching the top of the search engines takes a lot of hard work and a good SEO strategy. It includes identifying target keywords to incorporate into your web pages, creating SEO friendly URLs, using images, videos and infographics and making sure your website loads quickly - the list goes on! Check out this tutorial from Bruce Clay Inc. It explains how to optimize a website step-by-step. Gone is the time of Yellow Pages and printed ads! Four major aggregators collect and spread business information over the internet: Factual, Axiom, Localeze and Infogroup. They push information to search engines like Google, Yahoo, Bing, Yelp and many others. It is very important that all of these search engines have the same Name, Address and Phone number (NAP) for your business. Keeping all of this information accurate and free of duplication takes a lot of effort and manual labor. There are several companies that will do these submissions a fee: Bright Local, UBL, Whitespark, Mozlocal, Synup and Yext. I have used Synup, Yext, Bright Local & manual submissions (which I do not recommend) in the past, but I settled on Yext. Yext offers fast, accurate listings through an user friendly dashboard. Don't let the complexity of local search scare you! 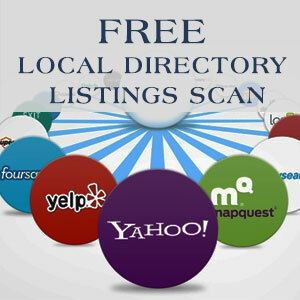 Do a scan for your local business today and let us help you!